Hypocortisolism is also known as Addison's disease. It is a kind of hormonal disorder that affects the endocrine system of the body and causes less production of steroid hormones by the adrenal glands. Steroid hormones such as glucocorticoids and mineralocorticoids are required for the normal functioning of the body. Although the disorder is not so common, but if it is left untreated, it may cause several complications. Ayurveda offers a great way to manage this disorder. Ayurveda, one of a powerful system of healing, provides a natural way to cure any disease. It is developed in India, thousands of years ago. Ayurveda believes that any health problem occurs when there is imbalance in dosha or doshas. There are three doshas (Vata, Pitta and Kapha) which are also known as the energies of the body. As they are three in number, these doshas are also known as tridoshas. Ayurveda helps to balance the aggravated doshas and thereby helps in the management of the disease. Balancing of doshas not only involves Ayurvedic medicines, but also a healthy diet and a healthy living style too. Exercise is also given equal importance by Ayurveda in order to maintain a healthy body. Hypocortisolism occurs when androgen levels in the body is lower than normal and this condition is more prominent in women. 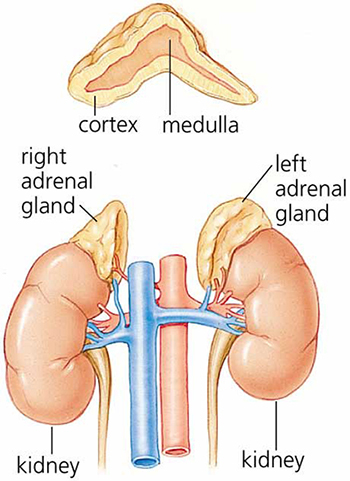 There occurs a deficiency of cortisol in the body due to underactive adrenal glands. Autoimmune conditions in which immune system attacks the adrenal glands of the body. Some infections, such as those of tuberculosis and fungi may pose a risk for developing this disorder. Cancer of the adrenal gland is another main cause of Hypocortisolism. Genetic causes for Hypocortisolism involve congenital disorders such as Adrenal hypoplasia. It is a condition in which there is an underdevelopment of the adrenal gland from birth. Sometimes, surgical removal of the adrenal glands may cause Hypocortisolism. The anterior pituitary may be diseased due to infection, cancer or radiation therapy. Underactive pituitary gland may cause ACTH deficiency. Hypoglycemia (Low blood glucose levels). Muscle weakness, muscle aches and joint pains. Weight loss, Fatigue, Nausea, Vomiting. Ayurvedic medicines can be a great way for the management of Hypocortisolism. Planet Ayurveda offers various Ayurvedic medicines that are prepared using natural herbs in it. These medicines are free from side effects. Hence a good option to treat any disease. Planet Ayurveda provides following effective Ayurvedic medicines for the management of Hypocortisolism. The herb Ashwagandha (Withania somnifera) contains steroidal alkaloids and lactones and hence a great way to manage this adrenal gland disorder. The herb is frequently used in Ayurveda for a number of health purposes. Planet Ayurveda offers Ashwagandha capsules, which are prepared using the standardized extract of this herb. Pack size- Each bottle contains 60 capsules in it. Dosage- 1 capsule two times a day, with plain water, after meals. Curcuma longa (Curcumin) is also an herbaceous plant which is beneficial for the adrenal glands. Planet Ayurveda offers a product which is made from this herb and the product is Curcumin capsule. This product is highly effective for Hypocortisolism. Pack size- Each bottle contains 60 capsules. Dosage- 2 capsules, two times a day, with plain water, after meals. Immune magic of Planet Ayurveda is also a great Ayurvedic medicine not only to manage Hypocortisolism but also an excellent one to maintain a healthy immune system. Each immune magic capsule contains the combination of four ingredients. These ingredients include grape seed (Vitis vinifera), Cow colostrums (Bovine coloustrums), Bhumi amla (Phyllanthus niruri) and green tea (Camellia sinensis). The herb Trigonella foenum graecum is an excellent herb for the maintenance of the adrenal glands. Fenugreek capsules from the house of Planet Ayurveda are made from the pure extracts of this herb. The seeds of this herbaceous plant are enriched with phosphates, lecithin, trigonelline, choline, trimethylamine and iron. Dosage- 1 capsule, two times a day, with plain water, after meals. 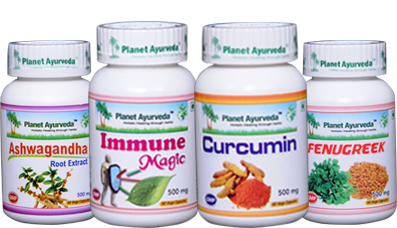 Planet Ayurveda offers best quality products that are 100 percent pure and natural. All of them are 100 percent vegetarian and are made from pure herbal extracts without the addition of chemicals. As these are prepared without chemicals, all of them are safe to use and do not cause any side effects.